Due to the inclusion of several features that require updated BD Java compatibility, your Blu-ray player may require a firmware update in order to properly play this disc. More info here. Following the resounding critical and commercial success of 'Pirates of the Caribbean: The Curse of the Black Pearl,' this second installment in the series had a lot to live up to. And while I loved the first film (you can read my review here), unfortunately 'Dead Man's Chest' was everything I feared its predecessor would be -- a loud, boorish, overcomplicated, hollow theme park attraction posing as a movie. It's rather amazing that despite having an even bigger budget and the same talented cast and crew behind the camera, 'Dead Man's Chest' only proves the old adage "less is more" all too true. When we last saw the characters of 'Pirates of the Caribbean,' things were looking pretty good for our merry band of plunderers. The evil Barbossa (Geoffrey Rush) had been vanquished, Captain Jack Sparrow (Johnny Depp) was a free man, and lovers Will Turner (Orlando Bloom) & Elizabeth Swann (Keira Knightly) were all set to live happily ever after. Sure, Sparrow still had a debt to play to the legendary Davy Jones (Bill Nighy) or risk losing life and limb, but Jack's gotten out of tough jams before -- even of the supernatural variety. As 'Dead Man's Chest' blasts off, Jack, Will and Elizabeth are thrown together yet again to defeat a new enemy -- the slimy, tentacled Jones (truly a CGI wonder of oozy realism). In order to lift his curse, Jack must find the key to the contents of the Dead Man's Chest and deliver it to Jones, the Captain of the Flying Dutchman, a legendary spectre of a pirate ship. Along the way, Jack will nearly fall prey to a band of cannibals, while Elizabeth will have to go solo in a bid to rescue Will from Jones' even more wretched minions. But that's nothing compared to the fabled Kraken, a giant sea creature that Jones wants to keep fed and happy -- even if it means tossing Jack right into its dripping jaws. Needless to say, along the way we can expect plenty of sword fights, swashbuckling, sparring banter and Jack's usual selfish shenanigans. Unfortunately, all of these plot points are so convoluted that they defy such concise description. It is as if returning screenwriters Ted Elliott and Terry Rossio seemed to suddenly lose faith in their characters, despite the gargantuan success of the original film. They litter 'Dead Man's Chest' with endless subplots, narrative cul-de-sacs and unnecessary action sequences -- most of which have little to do with (nor do they carry any consequences for) our heroes. For example, the entire 20-odd-minute sequence involving Sparrow and an island of cannibals could have been completely chucked from the movie and have had zero impact on the overall plot. Same goes for the disappointing climax, which offers little resolution aside from setting up another sequel. 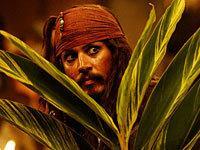 But by far the biggest disappointment in 'Dead Man's Chest' is Depp himself. Though Captain Jack Sparrow was certainly a major character in 'Curse of the Black Pearl,' his role was primarily there to support the story of Will and Elizabeth, which gave that film a genuine sense of heart and emotion. But following Depp's Oscar-nominated turn in the original (and the huge response he garnered from audiences), Captain Jack was promoted to star in 'Dead Man's Chest,' which just about ruins the charm of the character. Where Depp's fey performance in 'Curse' was subversive and sublime (Disney execs reportedly almost had a coronary when the first few days of dailies came in), now he's just pandering to the cheap seats. It's hammy, obvious and gimmicky. There is no longer any hint of danger, or that spark of excitement in waiting to see what Depp is going to do next. It all feels a bit predictable and hollow, and -- like 'Dead Man's Chest' itself -- panders to our expectations instead of challenging them. Still, 'Dead Man's Chest' is worth seeing on Blu-ray, if only for the spectacle of it all. The film's technical specs are absolutely second-to-none. Aside from the obvious CGI overload of the Kraken, the rest of the film seamlessly merges the practical with the digital. The fantastic sets, costumes, production design and stunts are all a sight to behold -- there are numerous sequences in 'Dead Man's Chest' that, taken on their own terms, are truly breathtaking. Though it may lack any sense of narrative drive or urgency, Sparrow's escape from the cannibals is exquisitely staged, and the climactic sword fight on an out-of-control water wheel ranks as one of the finest scenes of its type ever seen in cinema. Unfortunately, all the sound and fury signifies little. Cluttered, overlong and lacking characters to genuinely care about, 'Dead Man's Chest' is the equivalent of sugar shock. See it only to be wowed by Hollywood craftsmen working at the top of their game. 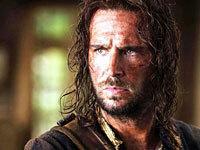 But compared to the fun and adventure of 'The Curse of the Black Pearl,' 'Dead Man's Chest' can only rate as a major disappointment. I watched 'Pirates of the Caribbean: Dead Man's Chest' immediately after 'Curse of the Black Pearl,' and it was a very tough act to follow. As I gushed in my review, 'Pearl' looks fantastic in Blu-ray. Happily, when it comes to picture quality, 'Dead Man's Chest' is every bit 'Pearl's equal -- in fact, it's even a bit more impressive in some respects. Though both films share a completely consistent visual look, 'Dead Man's Chest' is filled with even more spectacular nighttime setpieces and all manner of squishy, half-rotted supernatural creatures. This transfer is more than up to the challenge, setting a new benchmark for detail and dimensionality. 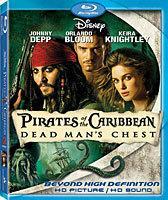 As with 'Curse of the Black Pearl,' Disney presents 'Dead Man's Chest' in 2.35:1 widescreen and 1080p/AVC MPEG-4 video. The source is absolutely pristine, with nary a speck of dirt or blemish to be found. Film grain just doesn't seem to exist, yet this is a picture that always looks incredibly life-like and natural. Colors are beautifully rendered, from the rich orange hues of the sun-drenched exteriors to the rock solid midnight blues of the Jolly Roger. Shadow delineation is extraordinary -- every last, oozy, puss-filled tentacle of Davy Jones is visible. Whatever its other virtues, 'Dead Man's Chest,' is a tour de force of production design and seamless integration of CGI, and both are done massively proud here. This disc is also a great test case for the considerable upgrade Blu-ray can offer over standard-def DVD. Though the standard-def transfer of 'Dead Man's Chest' was certainly superior to the noisy, edgy 'Curse of the Black Pearl' DVD, both are blown out of the water by their high-def counterparts. Depth is never less than eye-popping -- I don't think a single shot in 'Dead Man's Chest' looks anything less than three-dimensional. The image is smooth, free of edge enhancement and other obnoxious digital processing tricks, and contrast is not at all jacked up resulting in blown-out whites or lessened fine detail. In short, 'Dead Man's Chest' is the kind of top-tier next-gen presentation we all hope for when a studio unleashes a highly-anticipated blockbuster title on high-def. As they did for 'The Curse of the Black Pearl,' Disney also grants 'Dead Man's Chest' an uncompressed PCM 5.1 surround track, again encoded at 48kHz/24-bit/6.9mpbs. This one is another stunner -- just about any scene in 'Dead Man's Chest' could serve as demo material for your home theater, surpassing any other soundtrack yet heard on Blu-ray. Like its predecessor, 'Dead Man's Chest' may suffer from a bit of sonic overkill, but who cares when it is so damn entertaining? There are three or so sequences here that are just a thrill to listen to -- namely the extended cannibal capture of Jack Sparrow, the two Kraken attacks on the Jolly Roger, and in particularly the now-famous climactic sword fight on the out-of-control windmill. The transparency of the channel imaging and pinpoint-accurate placement of discrete effects can only be described as the pinnacle of epic Hollywood sound design. The sheer force and effectiveness of the 360-degree soundfield replicated here is simply stunning. Dynamics are also outstanding. Just listen to the scene where Davy Jones plays his gigantic organ, while thundering rain and waves pound against the outside of his ship. The heft and tightness of the bass, and the rich smoothness of the high-end -- it's incredibly vivid and life-like. And as was the case with 'Pearl,' dialogue and subtle details are not lost in the din. I was shocked that I never had to make any volume adjustments during the film for dialogue, nor tone down the rears, which can often be a problem when bombastic soundtracks over-crank specific effects to unreal levels. Simply put, 'Dead Man's Chest' is a master class in how to do home theater audio properly. 'Pirates of the Caribbean: Dead Man's Chest' is another two-disc treasure trove of extras (sorry, couldn't resist the bad pun). Though there are noticeably fewer audio commentaries than accompany its predecessor, the making-of material is far more in-depth and intriguing, and there is no fluff to pad out the second disc. Plus, the making of 'Dead Man's Chest' is legendary for having been one of the most arduous shoots in recent Hollywood history, making the story behind the story that much more fun. Let's start with disc two, which features two key documentaries. "Charting the Course" runs 26 minutes and covers pre-production, while the mammoth 63-minute "According to Plan: The Harrowing and True Story of Dead Man's Chest" is a surprisingly frank and revealing look at the film's arduous shoot. Typical of Hollywood sequels these days, 'Dead Man's Chest' started shooting before the script was even finished, which only exacerbated a host of problems to come, including lost sets, natural disasters and an often irate director. Gore Verbinski is shown here in a not-always-flattering light, as he loses his temper over the lack of a finished script and the endless setbacks in staging the movie's many gargantuan action sequences. There is also plenty of impressive behind-the-scenes footage and the usual on-set cast and crew interviews. Similar to such classic making-of documentaries as "Under Pressure: The Making of 'The Abyss,'" these two docs combined form a film-school-on-a-disc that's a must see for any cineaste or aspiring filmmaker. Next is a collection of a assorted featurettes focusing on more specific aspects of the production. "Meet Davy Jones: Anatomy of a Legend" (13 min.) reveals how they turned genial British actor Bill Nighy into a teaming (if utterly believable) mass of CGI tentacles; "Fly on the Set: The Bone Cage" (4 min.) dissects one of the movie's more intricate action sequences; "Mastering the Blade" (16 min.) is a three-parter that shows how actors Orlando Bloom, Keira Knightley and Jack Davenport successfully trained in the art of swordplay; while "Captain Jack: From Head to Toe" is seriously a 22-minute featurette on the character's complete wardrobe, from hat to shoes. I guess you know you're a cinematic icon when even your dingles get their own fawning retrospective. After such an in-depth set of documentaries and featurettes, I suppose a suite of audio commentaries like those found on 'Curse of the Black Pearl' really aren't necessary. Surprisingly, neither Verbinski nor producer Jerry Bruckheimer contributed a track this time around, and there's no star power here either. However, we do get one rather fine commentary on disc one, with co-screenwriters Ted Elliott and Terry Rossio. These guys were a couple of the biggest cheerleaders for 'Dead man's Chest' during the film's initial round of publicity, despite taking a huge hit from the critics. It's a great chat, with both men refreshingly honest about the script's weaker aspects, and the challenge of writing not one but two sequels back-to-back. Though it's a bit lengthy given the film's 150-minute runtime, any fan of the 'Pirates of the Caribbean' world and its characters should give this one a listen. Wrapping things up, the only complaint I have with this supplement package is the same as the one I had with 'Curse of the Black Pearl.' No effort has been made to upgrade the video of the supplements to 1080p resolution, so especially with the second disc of supplements, you're really just getting a standard-def DVD reformatted on a Blu-ray disc. That doesn't make these supplements any less impressive in terms of content, but it does make the presentation simply... standard. Despite being a big fan of the original 'Pirates' flick, I was rather disappointed with 'Pirates of the Caribbean: Dead Man's Chest' as a film -- it's just too much of the same, only more convoluted and impersonal, and with a now-predictable performance by the wincing Johnny Depp as Captain Jack Sparrow. As a Blu-ray release however, this one leaves no doubt that Buena Vista has upped the ante on what a next-gen release should be. 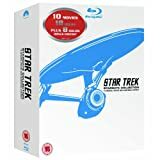 Flawless video and audio, a complete port of the standard-def extras, plus a brand new Blu-ray-only game make this one a no-brainer. Even if (like me) you dislike the film itself, as the new standard-bearer on Blu-ray, 'Dead Man's Chest' is a must-have.